Soaking in sunshine for 24hrs. During June and July, the Sun does not set below the horizon and we can experience the most amazing colours and stunning views. This is guided trip take you exploring the Urho Kekkonen National Park, and we will make serveral stops to admire the amazing nature. The hike is moderate, you will learn about the arctic wildlife and plants along the way. When we find a perfect spot, let’s have a coffee break while experiencing the nightless night. *Available : 31st July - 30th Oct. 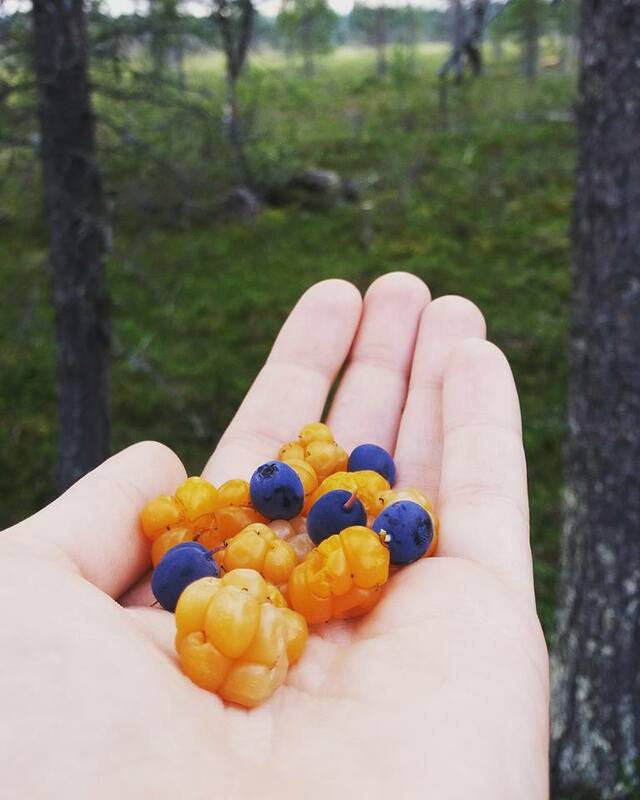 The northern nature is full of gifts – wild berries and mushrooms, which provide nutrition that make us feel good. We will hike through the national park and pick berries or mushrooms that are in season. We might spot raspberries, blueberries, cloud-berries, bilberries and lingon berries.... etc. The Finnish mushroom season starts from early-May to late-November. Most of the best edible mushrooms are collected from late-summer to early-autumn. After hunting those natural treasures, our guide will prepare pancakes serve with what we have found in forest. This is guided trip take you exploring the Urho Kekkonen National Park, one of Finland’s largest natural conservation areas. It is named after Finland’s longest serving president. You will be surrounded by wild nature and inhale the cleanest air on the planet. The nature is so pure that you can actually drink straight from a mountain stream. You will learn about wildlife and vegetation of the arctic wilderness. We might also spot wild berries or mushrooms on the way. Halfway our guide will build a campfire and make you a delicious soup lunch. Note: Please wear comfortable outdoor clothes and shoes. Hiking trip can be physically demanding - not recommended to small children. Our guide will greet you at the meeting point, and drive with minivan heading to Inari. We start our day visiting SIIDA museum- It is a window on Sámi culture and the diverse nature of Northern Lapland. At Siida, you can acquaint yourself with changing exhibitions on culture, art and nature throughout the year. Lunch is arranged at SIIDA’s cafeteria – Sarrit. After lunch, we will take a cruise around Inari Lake. This cruise starts right from the harbour by the Sámi Museum, SIIDA, and will take you to Ukko Island. Lake Inari is the third largest lake in Finland and is home to over 3300 islands. The sacred Ukko Island (or Ukko´s Rock) was used as a Sámi sacrificial offering ground right up until the 19th century. At Ukko Island we will have the chance to admire the view from the top of the island. The catamaran has 120 seats. On board you can buy coffee, tea, wine, beer and small snacks on your own cost. Do you believe in magic? A mystical fox bushy tail spraying snow and throwing sparks into the sky, made the Northern Lights. Not sure where to go ? - Aurora Hunting with minivan is a good option for you. Our guide will take you to the area where the most possible to see Northern Lights on that day.Sometimes sky might be clear a bit distance from Saariselkä, so having a minivan we could bring you further. When we find the right spot, there will be time for taking pictures and having hot drinks with snacks. Please note : Northern Light is natural phenomenon, we are not able to predict its appearance, activity and colours.